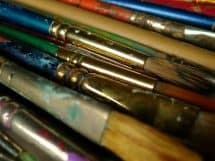 This is the second part of a series of homeschool reviews of our curriculum for this school year. 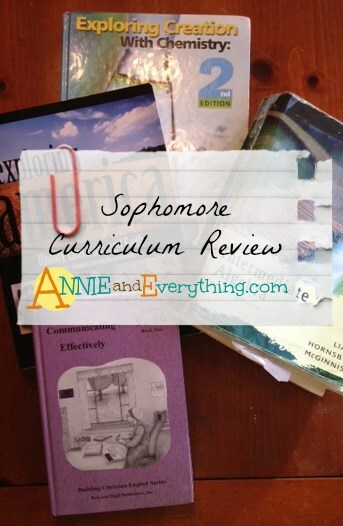 The first part reviews the curriculum our senior is using. 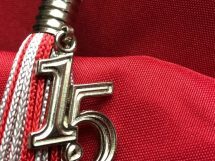 We have three students this year, so this post is about the sophomore; and the third and final part of the series will be about our sixth grade curriculum. It is our one and only son who is the sophomore this year. However, all of these choices were actually selected for his oldest sister and have been used by each successive sister since then. Did I mention budget has always been a huge consideration for us when picking out curriculum? I know none of you ever have to deal with that… 🙂 But in reality, there has been no reason to change any of these, as they’ve all been satisfactory for us. 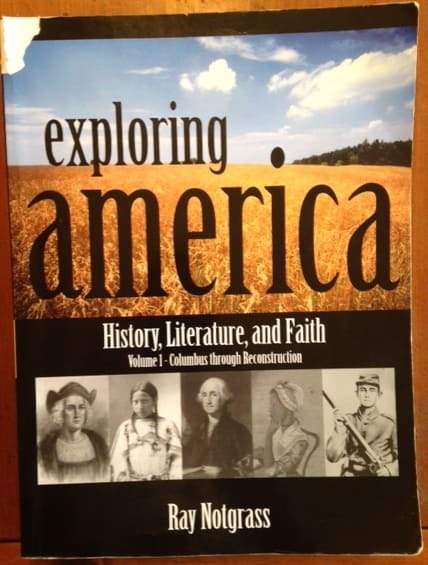 Notgrass American History – This course is actually designed to be an all-inclusive three credits for Bible, English, and History, but we just use it for history. 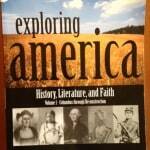 It consists of a text and supplemental primary source readings, and there is an optional quiz/test book. The English part of the course does provide a great selection of hisorical fiction that ties in with the time period being discussed (reminiscent of Sonlight), so we do add some of those to our assignment list. 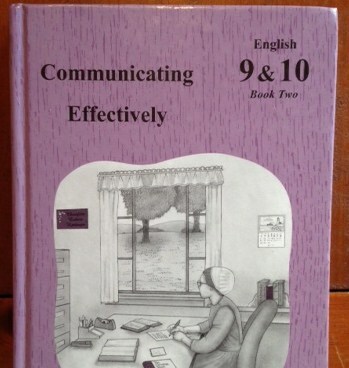 Rod and Staff English 10 – I can’t say enough good about the Rod and Staff English texts! Very thorough, very systematic. Not very exciting, and definitely full of Mennonite references – but they give a GREAT foundation in grammar and writing. Tenth grade is the last year they have a text for—but after this kids need to be doing literature courses, anyway. 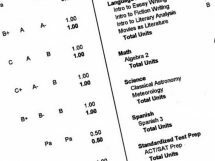 Mine have all done extremely well in the English/Reading portion of standardized tests, and I think R&S is a huge reason why. German 3 with Oklahoma State University – our senior is doing German 1 with this online course this year, so check out the review here. German 3 is the same except that the worksheets are also done online and submitted for grading. Our son has been using this course since German 1 in eighth grade, and I wish now that we’d used it for all the kids. 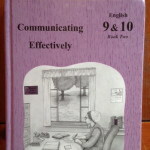 Foreign language can be a tough subject to do via homeschool, but this course does it very well. 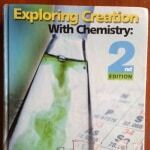 Apologia Chemistry – I also can’t say enough good about the Apologia courses. They have all been very readable for the kids and seem to be a thorough treatment of the subject. We always buy the study guides (not sold by Apologia; I got ours at Rainbow Resource) so that lesson planning has already been done for me. Chemistry is our one lab course for the high school years; it’s the easiest one to implement a lab for, in my opinion. (And you may be getting the picture now that I am all about easy!!) These courses not only teach the subject but force the student to learn how to study for tests. I like that. 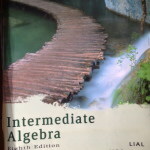 Intermediate Algebra by Lial – When it was time for the eldest to do Algebra 2, I did some research and bought a very highly recommended text that was also very expensive — because math is important and we want only the best, right? A few weeks into it, it was obvious that that text was not going to work for us. It was very theoretical, very pie in the sky, very intellectual—and very NOT easily understandable! I used to teach math, long long ago, and I confess that even when I taught it in the public school system, I did not believe in all the hype about “we must understand WHY we solve the problem this way” that seems to be important now. My theory is, teach the kid HOW to do the problem, and after he’s practiced it a few hundred times over a few years, he will eventually understand WHY. 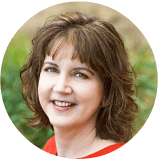 Have the kid memorize the multiplication tables and don’t worry too much if he doesn’t understand what multiplication MEANS right away. He’ll get it after using the numbers for long enough that it starts to click in his brain. But if he doesn’t memorize the tables, he’ll never be comfortable enough with the numbers to make those connections, or to move on to division. 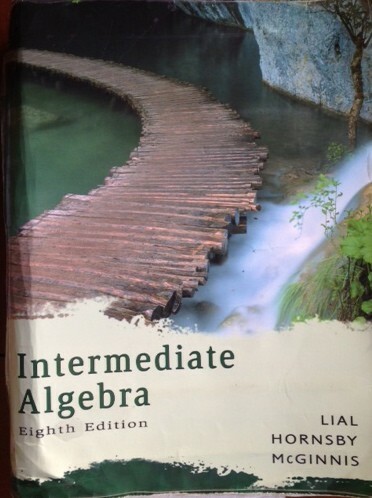 So, long story short, we found Lial, which is actually a community college textbook. It is very understandable and is made for self-instruction. AND it was only around $20 for an older edition!! That’s my kinda deal! Unfortunately, our paperback copy is beginning to fall apart; hopefully it will last long enough for one more student after this one. What is the name of the study guide for Apologia? I looked on Rainbow resources and couldn’t find it. Very interested in this. It’s called Daily Lesson Plans for Exploring Creation with Chemistry. Here is the link for the one for the latest edition of the text. They also have Daily Lesson Plans for the first and second edition. http://www.rainbowresource.com/product/sku/026821 Hope this helps!